For this month's "Maps Of The Month" featurette, I wish to draw your attention to Eishiya's Momodora: Reverie Under The Moonlight (PC) maps. In this prequel to the first Momodora, set four centuries earlier, Kaho the pirestess must stop a curse from the Kingdom of Karst which is spreading across the land. Will she be able to defeat the Accurst Queen of Karst and save her village? Momodora: Reverie Under The Moonlight is a platforming retraversal game, often referred to as a "Metroidvania" type of adventure. As Kaho, you will be travelling back and forth across the eastern Kingdom of Karst, which, as is often the case with many Metroidvanias, is a fairly large world full of dangerous obstacles and hostile creatures but also helpful items that will grant you access to more dangerous areas. It will be a much easier journey with the aid of these maps, thanks to Eishiya. Every pixel of this indie game's world is here, from the Sacred Odalia Grove to Karst Castle (and even the Development Room accessible only with 100%). 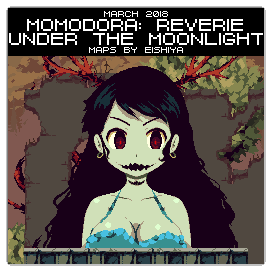 So to recognize the effort put into mapping this indie hit, Eishiya's Momodora: Reverie Under The Moonlight (PC) maps will be known as VGMaps.com's Maps Of The Month for March 2018. Just noticed this! Thank you for featuring my map, and I'm really glad to see this game get more recognition.